Kevin Ranson, author of Matriarch: The Guardians, describes a vampire-hunting weapon unique to his fictional universe: the Decapitator. There were three items inside [the case]: a three-foot metal bar that ran the length of the case, a wooden stake with a metal tip and a concave clip-point blade sharpened on the inside of the curve. 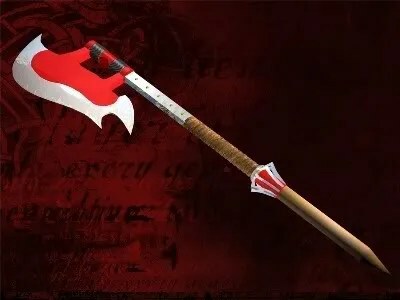 The attachments had been balanced to compliment one another when assembled into a five-foot long weapon, a blade on one end of the bar and a stake on the other. Seems like a pretty good weapon to me – decapitate with one end, stab with the other – but I wonder why it’s named after only one of its ends; seems like Double-Header or Amphisbaena would have been more apropos. In any case, a weapon like this would require some high-level armorer skills. And where can you find a good armorer these days? The Renaissance Faire? Assuming you found one, it would have to be a custom job, probably costing a hefty chunk of change. No wonder, then, that so many vampire slayers (like Buffy and the short-lived Kendra) make their own stakes. The problem, obviously, is that there are too few vampire slayers to achieve economies of scale in the manufacture of vampire-hunting weaponry. If only more people were aware of the vampire threat, there would be sufficient demand to permit the use of mass-production techniques — thus lowering the cost-per-weapon relative to artisanal armorers. Once we have functioning markets in vampire-hunting weapons, there’s a question as to whether those markets will be efficient. That question is addressed in-depth in Charlotte Weil and Sebastien Lecou’s chapter in Economics of the Undead, “To Shoot or to Stake, That Is the Question.” But their analysis is limited to stakes vs. firearms and silver vs. wood. The market for double-headed polearms will have to wait for Volume 2. This entry was posted on Thursday, August 28th, 2014 at 1:14 pm	and posted in Uncategorized. You can follow any responses to this entry through the RSS 2.0 feed. It has been completed, case and all. Looks awesome! Question: why are there four heads but only one staff? Replacements in the event that one gets lost or breaks off in combat?